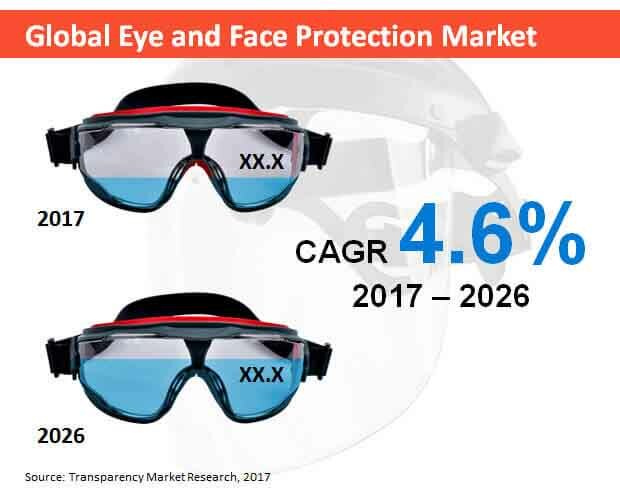 Competition in the global eye and face protection market is stimulated by innovation and cost-friendliness, says a Transparency Market Research report. As requirements of consumers evolve, players in the global eye and face protection market are striving to rollout products that will bear relevance. Further, products with higher comfort and lower cost are also the target among existing players. Some of the prominent names in the global eye and face protection market are Avon Rubber Plc., Ansell Limited, E I Du Pont De Nemours and Co., Kimberly-Clark, Honeywell International Inc., 3M Co., Msa Safety Inc., Uvex Safety Group, Grainger, Inc., and Bullard. Other organic strategies adopted by companies to stay ahead in the competition include acquisition and mergers, and opening new manufacturing facilities. The global eye and face protection market is expected to grow at a modest CAGR of 4.6% during the forecast period – 2017-2026. Further, TMR analysts state that the market will attain an overall value of US$4.5bn by the end of the forecast period. Geographically, the global eye and face protection market has wide spread and analysts deduce that North America will emerge as the leader in the coming years. The stringent labor laws and safety regulations will drive demand from industries in the future. At the same time, anti-laser and anti-UV eyewear will be the engines of demand in the global eye and face protection market. In order to strengthen their economies, many countries have adopted labor-friendly laws, and policies that are inclined towards protecting workers and environment. As a result, industries are required to ensure safety of their employees. Many organizations are procuring equipment and safety gear that invokes demand in the global eye and face protection market. Another aspect that drives demand in the global eye and face protection market is the rising pollution levels across the world. Pedestrians and motorists are finding it difficult to drive through polluted roads. It results in respiratory disorders and to protect themselves from particulate matter and polluting gases, people wear gears. This is expected to surge demand in the global eye and face protection market. Construction industry is predicted to drive growth in the global eye and face protection market. Countries in Asia Pacific are the cusp of development and as a result, the number of realty projects are shooting up. A trend here to be noticed is the demand for high-rises where workers are required to work with highest levels of precautions. This is considered to augment demand in the global eye and face protection market. While the demand in global eye and face protection market is set to climb in the coming years, new policies are increasing stringency of industry standards. At the same time, international standards are provoking companies to maintain strict norms. This demand manufacturers in the global eye and face protection market to stay updated with the latest requirements. Hence, they are expected to ensure the product are complying with the latest standards. At the same time, diverse applications of products in the global eye and face protection market is likely to open new avenues of growth. Manufacturers will be looking to explore these opportunities, as a result, it will stoke demand in the global eye and face protection market.